Peterborough Town thirds will save themselves from relegation from Hunts Division Two with a win at Barnack on Saturday. 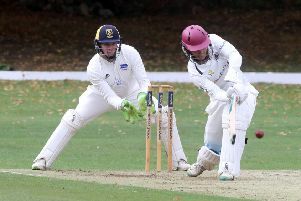 The city side moved out of the relegation zone last weekend with a crucial 94-run success over bottom club Alconbury. Opener Martyn Gibson cracked 85 with Richard Hingston adding an unbeaten 49 down the order as Town closed on 212-5. Nadir Haider’s 5-21 ensured Alconbury finished well short. Old Eastonians can still overhaul Town. They complete their season this weekend with a home match against Orton Park. Town seconds still have some work to do to ensure they have another season in Northants Division One. Bob Milne’s battlers opted for dogged defence in their match at East Haddon to secure a draw. The home side piled up 289-6 with opener Robbie Povey smashing 11 sixes in his innings of 138. But Balaji Ganesan, Daniel Oldham and Kyle Medcalf batted with great patience as Town closed on 120-7. Oldham took 87 balls over his 22! Town are at Finedon seconds this Saturday.